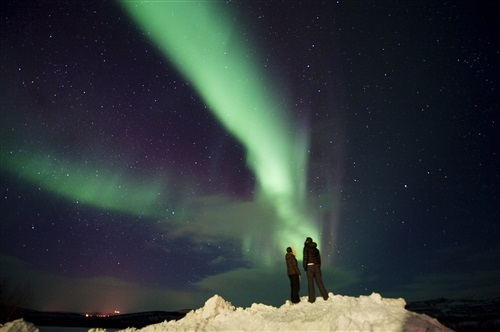 Watch nature's lights show spectacular display above you in perfect settings. 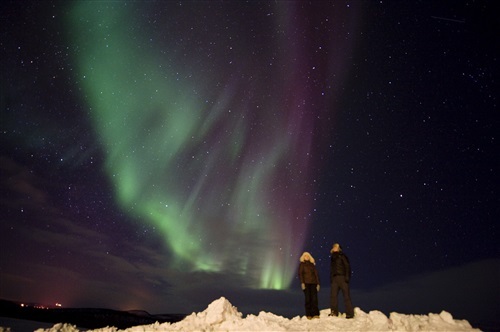 Winter in Norway presents a once-in-a-lifetime experience of watching Northern Lights, discovering untamed scenery in Arctic wilderness, spending a night in an igloo, experiencing the Sami way of life first hand with a reindeer owner, and dog sledding. 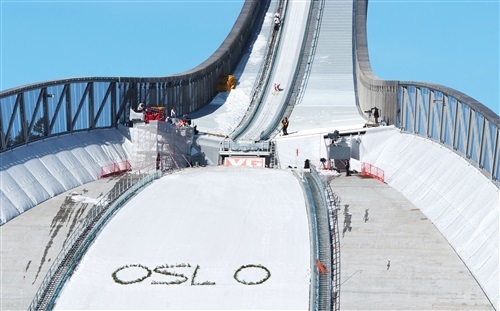 Day 1: Arriving Oslo International Airport Gardermoen, you will be welcomed by your private driver who will take you to your first class hotel in downtown Oslo. Transfer time is about 45 minutes. 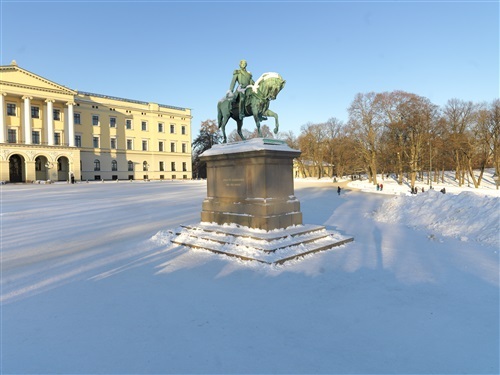 There is time to relax in the hotel or perhaps you rather want to stroll around for a bit, seeing some of the sights in the vicinity - the Parliament, the old university buildings, the Oslo City Hall or the elegant Royal Palace, superbly located at the end of the city's main street, the Carl Johan. In the evening, a romantic dinner at one of Oslo’s best Michelin star restaurants. 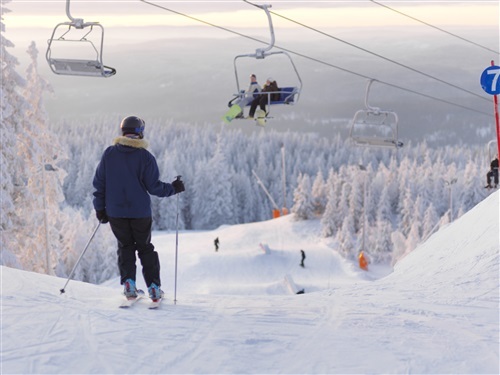 Day 2: Your private driver will pick you up at the hotel and take you back to Oslo’s airport for your non-stop flight to Alta in Lapland. En route you will cross the Arctic Circle. Arriving at Alta airport, far beyond the Arctic Circle, you will be greeted by your private expert guide who will be your host and guide for your entire stay in Norwegian Lapland. From the airport you will first be taken to a restaurant in Alta where you enjoy lunch with your guide who will go through the exciting program for your stay and make any adjustments that you might wish to incorporate. Your guide will now bring you into the wilderness, just a few minutes outside of the small town Alta. 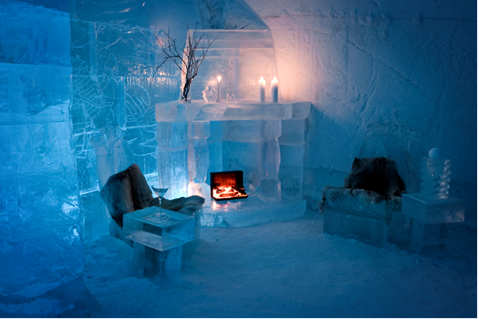 You are in for a unique experience - you will spend the first night in Lapland in the fairytale-like Alta Igloo Hotel. Surrounded by snow and beautiful ice sculptures you will be tucked away in nice and warm sleeping bags and your ice bed will be covered by reindeer furs. Next to the Igloo Hotel there is a warm building with restaurants, toilets and saunas. In the evening, you will enjoy a 3-course dinner and afterwards we recommend you to take a walk outside in the dark Arctic wilderness to look for the Northern Lights. Provided there are clear skies you will almost always see it! Before you go to bed you may want to enjoy a warm sauna, or perhaps you would prefer to experience the sauna the next morning? It is up to you! 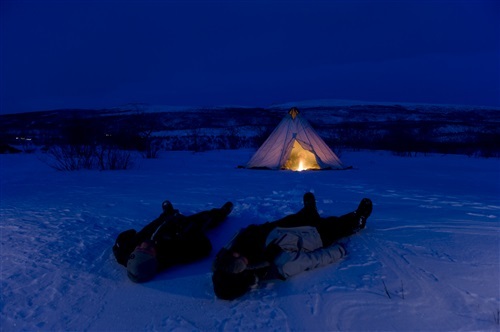 At 7.30pm it is dark and your guide will pick you up at the Ice hotel and take you on a "Northern Light Safari". Provided it is clear skies you are almost guaranteed to see it! Your guide will take you to the best places to watch this fantastic natural phenomenon. Your guide will bring you back to the ice hotel around mid-night. 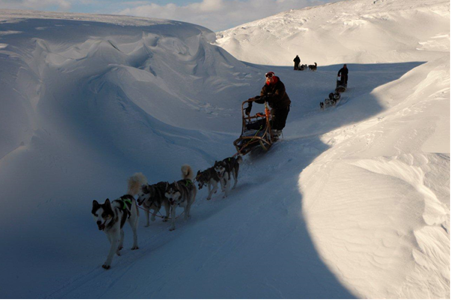 Day 3: Your guide will pick you up at the ice hotel and take you on an exciting dog sledging ride. From the hotel you will drive to a nearby farm. Here you will meet the huskies and you will be taught how to handle your own team of dogs and sledge. All necessary equipment will be provided. This is a small group public tour. The group will divided into pairs, and each pair will set off with their own team of dogs on an exhilarating ride through the primal forests that surround Alta. 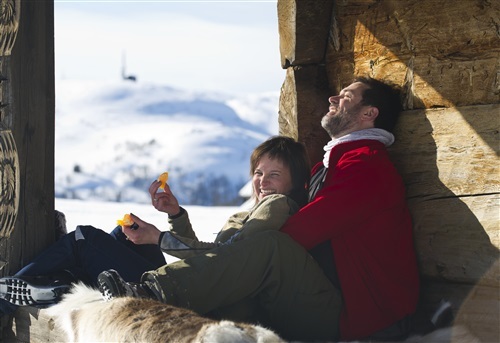 On this tour you will be consumed by the beauty of this magic snow-covered wood as your dogs take you up anddown hills and zigzagging between the pine trees. It is completely silent - the only thing you can hear is the dogs’ feet hitting the snow as they run. Lunch will be taken by the open fire sitting on furs in a Sami tent called lavvo. In the shelter of the magnificent blue twilight hour, it is time to return to your hotel. You will return to the dog farm and your guide will bring you to your new "warm" hotel in Alta. Here you will be accommodated in a suite overlooking Alta. 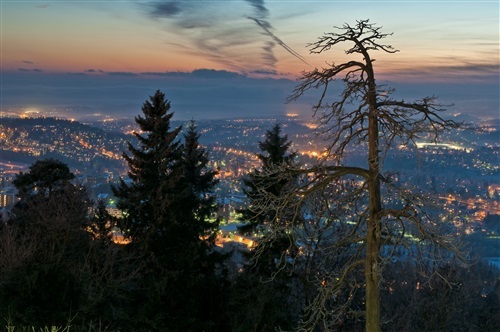 After dinner at 7.30pm it is dark and your guide will pick you up at the hotel and take you on a "Northern Light Safari". Provided it is clear skies you are almost guaranteed to see it! Your guide will take you to the best places to watch this fantastic natural phenomenon. 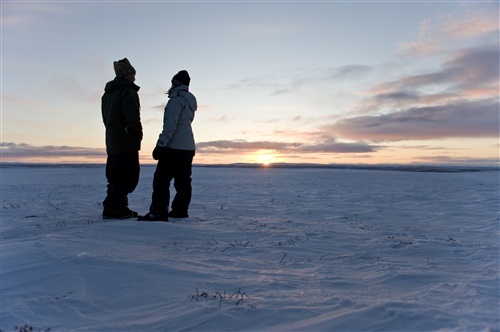 Day 4: Your private guide will pick you up and drive you into the wilderness, to Kautokeino. This is one of the main areas of the Sami tribal people. 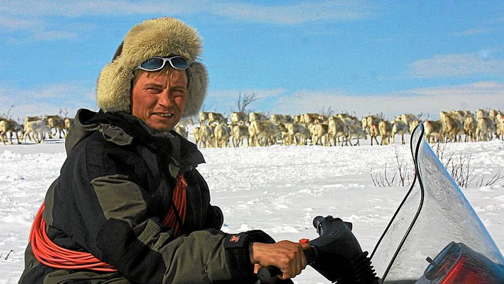 They are semi-nomads and make their living from what the reindeer can produce. 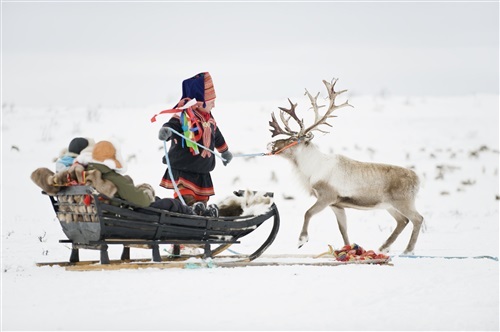 Arriving at Kautokeino you will meet with Mr. Buljo, who is the owner of a reindeer herd of about 700 animals. You will join Mr. Buljo on snow scooters as he is driving into the wilderness to look after his herd. 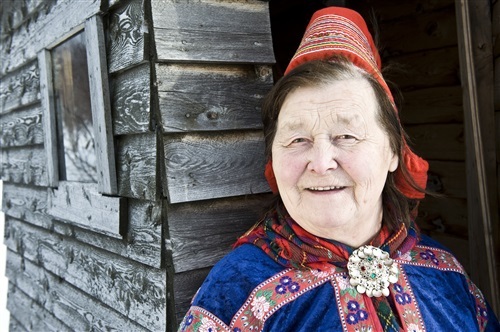 En route you will learn about the Sami tribal rituals, legends, culture and language and you will visit one of their "holy places" where they still perform their ancient rituals. During this very special day Mr. Buljo will invite you into his wilderness hut where he will prepare for you a traditional Sami lunch. 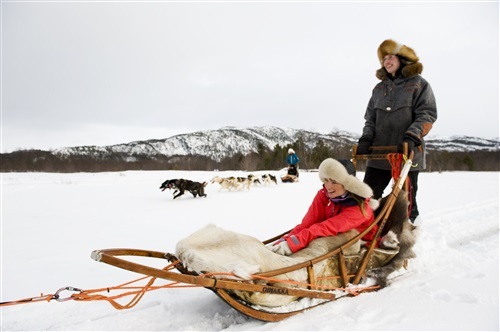 After lunch your host will teach you about the traditional Sami way of life and you will be able to ride the reindeer sledge - which is great fun!! In the afternoon you will return to Kautokeino by snow scooters and your guide will bring you back to the Rica Hotel in Alta. Dinner will be served at the hotel in the evening. After dinner we recommend that you go for a walk outside and look for the Northern Lights. Day 5: Today we are happy to introduce you to the Norwegian way of life and to our love for nature and the outdoors. This is a public small group tour. After breakfast at the hotel, your guide will pick you up and bring you out of Alta and into the snow-covered wilderness your adventure begins at one of the many beautiful frozen lakes in the area. The last part of the journey before you reach the lake will be on snow shoes. Arriving at the lake your guide will show you how to catch fish and on the shore of the lake there will be a Sami tent with an open fire. Here you can relax and get some warm drinks during the day. At lunchtime your guide will serve you a delicious traditional lunch as you sit on reindeer furs around the open fire in the tent. He will also tell you about the Norwegian way of life and whatever you want to know about Norway and the Norwegians. In the afternoon after dark, your guide will bring you back to the hotel in Alta. Tonight after dinner at the hotel, it is your last chance to watch the spectacular Northern Lights - Aurora Borealis! Therefore your guide will pick you up at the hotel at 7.30pm and bring you on the last "Chasing the Northern Light trip". Hopefully With a lot of wonderful memories and your camera full of amazing photos, you will return back at the hotel around midnight. 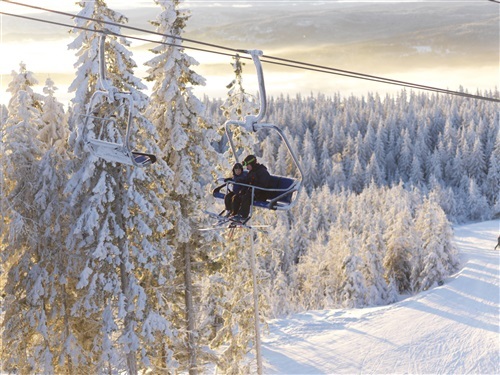 Day 6: Having enjoyed breakfast at the hotel and checked out, your private driver will pick you up and bring you back to Alta airport where you will catch the flight bringing you back to Oslo just in time for your international flight. This romantic getaway is ready to book. But remember, we can trim and stitch until it fits you perfectly.